Available in Coupé, Estate, Saloon and Convertible. 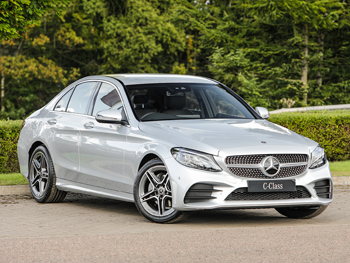 Like any athlete at the top of their game, the C-Class coupé has been honed to flawless performance. With its new Dynamic Select suspension, you can switch between Comfort, Sport and Eco mode at the spin of a dial. Customise the sporty look further with an array of fresh colour options and optional Multibeam headlamps. Exquisite design meets seamless comfort in the C-Class’s irresistible saloon guise. Look beyond the dazzling exterior, and you’ll discover a plush, opulent cabin inside, with sleek details and plenty of practicality. And the standard features are anything but, with leather seats, reversing camera and a nine-speed automatic gearbox. Raising the roof has never been so relaxing. Even with the top down, Mercedes-Benz Airscarf technology envelops you in your personal climate control. So you can turn heads, without turning up your collar. Why keep the style and luxury to yourself? In the estate, you can enjoy the slick equipment and plush interior – plus the size, practicality and comfort you need to delight the rest of the family, too. 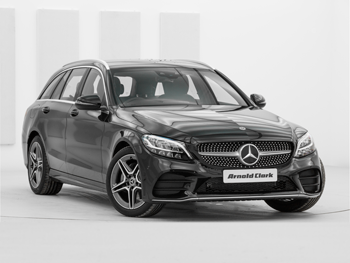 Height adjustable front seats, a roomy back seat and a generous boot are just a few more reasons to make a date with this estate. With dramatic, assured design features that look primed to take on the world, elegance comes naturally to the C-Class. Encapsulating the Mercedes-Benz philosophy of sensual purity, surfaces undulate and swoop with precision-tailored elegance. So whether you’re making executive decisions in the coupé, sitting comfortably in the saloon or captivating onlookers in the convertible, you can be certain your style is in a class of its own. Take one look at the treasury of tech that comes with every C-Class and you’ll be certain the future has arrived. From the second you engage the Keyless Start to the first time you let Active Parking Assist take over, you’ll experience innovation that’s innate.